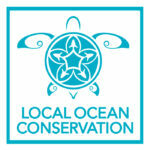 Local Ocean Conservation (LOC) is a private not-for-profit organisation based in Watamu, Kenya. LOC is committed to the conservation of special marine areas and endangered species, with sea turtles as the flagship species for healthy oceans. The organisation encourages the sustainable use and management of marine resources for the benefit of future generations and Kenya’s marine heritage, through empowerment, education and campaigning. The name Local Ocean was chosen because our goal is to encourage people to look after their own ‘local ocean’, creating a chain of sustainably managed areas of ocean. To this end we work alongside coastal communities, and like-minded NGOs, as well as the Kenya Wildlife Service and other applicable government agencies.